City dwellers renovate a pristine period home to fit their family's modern lifestyle. Fifi was sure to include plenty of seating spaces in the formal living room, including this cozy arrangement which includes an armchair from Design & Detail in a Zoffany fabric with nailhead trim, a settee covered in a Robert Allen trellis fabric from Design & Detail and a modern floor lamp. The custom CR Laine sofa from Design & Detail is upholstered in wool and has a pinstripe design reminiscent of a man’s suit for a softened masculine look. The homeowner didn't want a center table in the entry foyer, so the space is kept open with a family piano tucked to one side and a black leather barcelona chair. A Hickory Chair dining set underneath the original chandelier is an elegant, yet casual space for eating when the homeowner entertaining. 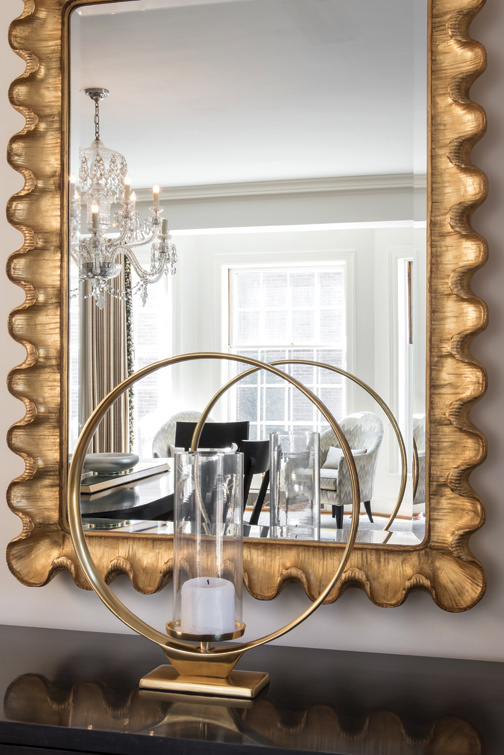 A custom gold mirror from Carver's Guild sits atop a Kravet chest. For something unexpected, Fifi chose a raw silk Schumacher fabric for the window treatment with onion tassels down the leading edge, which has a burlap-like look. SIde-by-side wood-topped islands fill the long and narrow kitchen. Fifi suggested adding mirrors to the front of the refrigerator and freezer doors to pick up natural light from the adjacent windows. "They make the room feel a little lighter," she adds. The hearth room addition was a major necessity to the homeowners, who have three small children. The space needed to be a part of the kitchen to make the space more useable for entertaining and weekly dinner preparations. 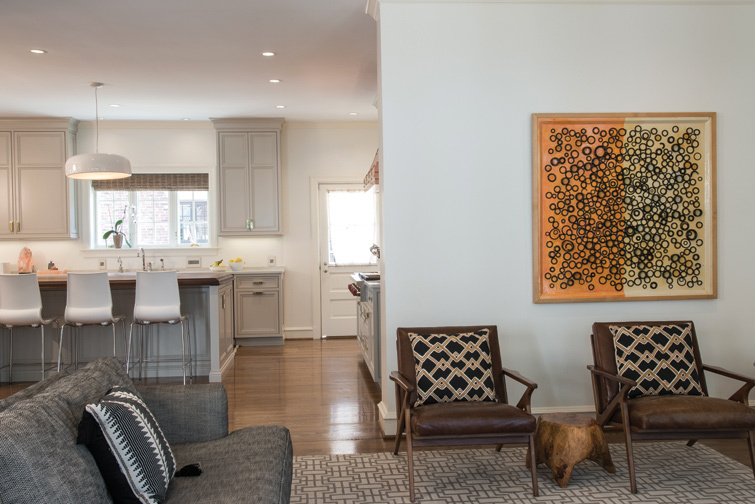 Having lived on their private, tree-lined street near Forest Park for eight years, a St. Louis couple and their growing family needed more space but couldn’t imagine leaving the quiet block they had come to love. Instead of saying goodbye to the neighborhood, they sent an email out to the private community asking if anyone was interested in selling. To their surprise, they received several responses, but all of the homes needed a significant amount of work, and they weren’t looking to bite off too big of a project. But one home in particular caught their eye. Meticulously maintained by the previous owners of 20-plus years, the two-story period home was in pristine condition and many of the original elements had been restored. “We loved the space, and it was perfect,” she says. “It was a beautiful, big blank canvas.” While not originally wanting to tackle any major changes in a new home, in the end the homeowners were willing to take on a large renovation because they loved this home and could make it work for their family and lifestyle. The couple immediately hired architect Paul Fendler of Fendler + Associates, Inc. to play with the footprint of the home. 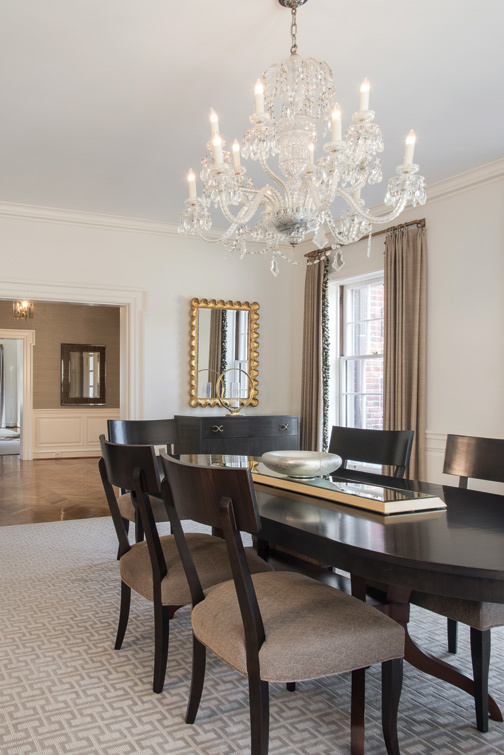 “Paul is amazing in his ability to remodel a period home in a seamless way,” the homeowner says. Fendler’s plans called for the widening of the opening from the dining room to the kitchen, the removal of a secondary staircase in the kitchen which would expand the space, plus the addition of a hearth room. 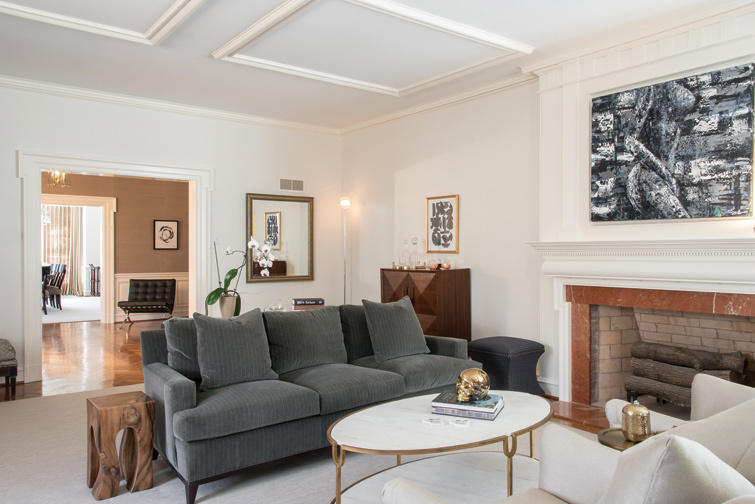 In addition to Fendler, the homeowners brought on Fifi Lugo, of Fifi Lugo Interior Design, and PK Construction to tackle the overhaul. The four-unit team met weekly to discuss plans, make changes and finalize decisions. The entire process took one year, and the homeowners lived in their previous home while the renovations were made. While walls were being knocked down and new ones built, the homeowner relied heavily on Fifi’s guidance to pull the interior together, which included ordering mostly new furnishings, rugs and accessories. “Fifi is a spitfire,” she says. “She has an incredible talent to bring your vision to life.” Characterizing her vision as semi-minimalist with a neutral color palette, lots of texture and a more masculine feel, the homeowner wanted to honor the architectural style of the home but add a more contemporary spin. “It’s just her,” Fifi says, classifying the home’s style. With the entry foyer, the homeowner and designer immediately set the tone that this home would be designed around the family of five and they way they live. The homeowner didn’t want a typical center foyer table you see in many older homes. With access to the piano from the homeowner’s childhood, Fifi suggested tucking it into the corner of the entry and reupholstering the bench in a zebra print. The black Barcelona chair is great for guests to sit or to throw a purse on when walking in the door. Fifi also covered the entry, stairwell and upstairs hall in a gray grass cloth to add texture. A similar approach to furniture placement and layout was taken in the formal living room. The homeowner wanted a comfortable space for her family, but she still wanted it to be suitable for entertaining. Fifi created multiple seating areas throughout the room so that the whole space is useable. “Her family can sit together by the fire, or they can entertain with 40-50 people and have plenty of space for everyone to sit,” Fifi explains. Durable and comfortable fabrics in a neutral scheme were key in making the space work for all occasions. “Sometimes it was hard to visualize what the finished pieces would look like by only seeing a swatch, but I completely trusted Fifi,” the homeowner explains. The two would meet in the space they were working on, and Fifi would throw out fabrics, colors and wall coverings to get a good visual and match pieces together. Across the entry from the living room, the dining room has the same feeling of subtle elegance. 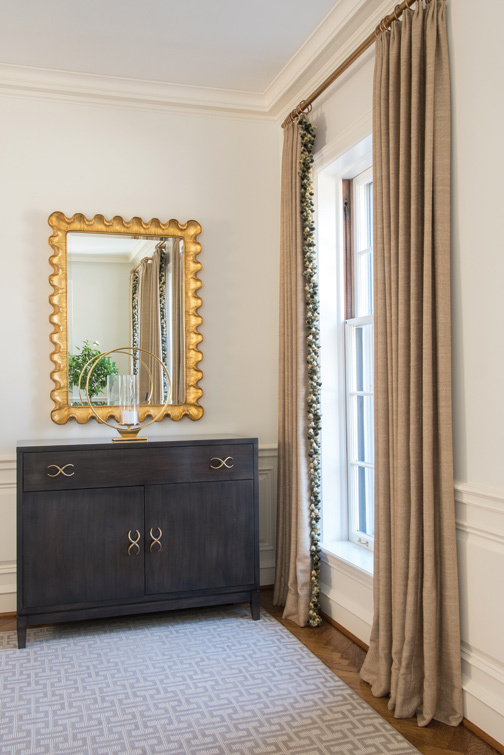 Custom raw silk draperies by Schumacher have a burlap-like look, and the homeowner loves how they are a little something unexpected in the space. When thinking about how her family would use the large, long dining room, the homeowner didn’t want a massive formal table that would seat 20. The black oblong table by Hickory Chair is simple and sophisticated hosting six diners in complementing chairs. 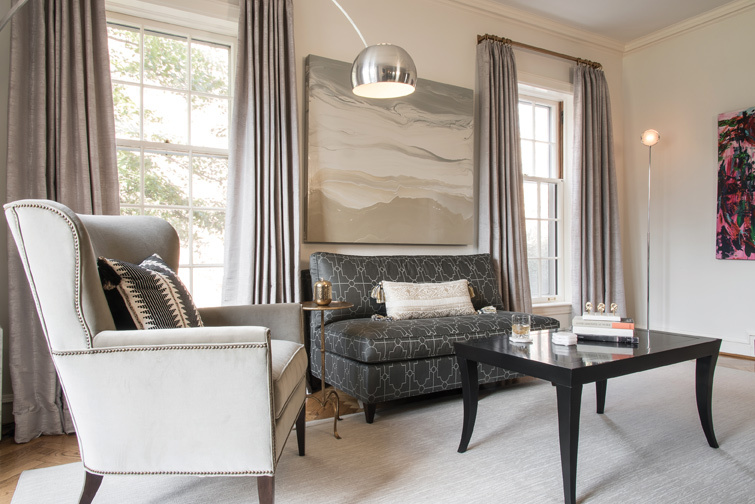 At the opposite end of the room, Fifi selected a set of armchairs and a cocktail table to sit in the bay window to give the space a welcoming feeling when the homeowners are hosting guests. “It’s a comfortable place to have appetizers or cocktails before dinner is served,” she explains. The homeowner loves to cook, so this space isn’t just aesthetically beautiful, it is a real-life working kitchen. She cuts, chops and preps directly on the butcherblock counters. While one island is primarily for food prep and seating, the second island is utilized for serving or working on projects. Custom cabinetry by Marc Christian Fine Cabinetry, and finished in a gray-beige color Fifi defines as “hazy skies,” contrasts and lightens the wood counters. She suggested adding mirrors to the front of the refrigerator and freezer doors to open up the kitchen since the space is so long and narrow. “The mirrors pick up a lot of natural light from the window making the space feel lighter and not as heavy,” she says. 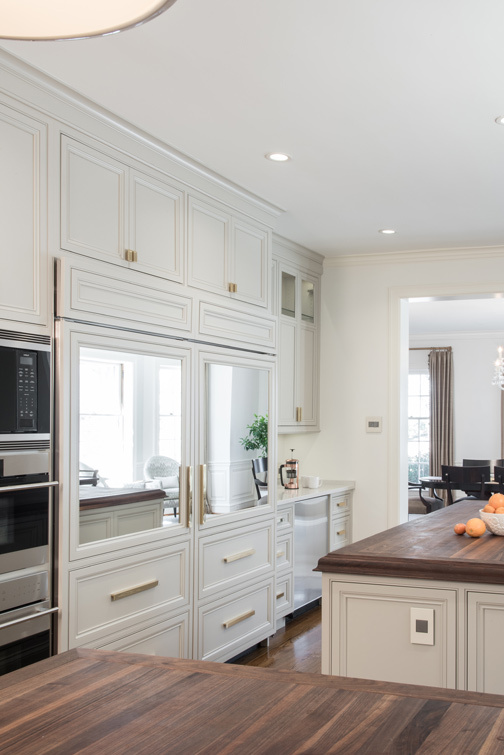 While the cabinetry hardware is more contemporary with clean lines, the brass finish gives it a period feel. Special attention was also paid to the inset detailing of the cabinetry to make it all feel original. “You don’t walk into this kitchen thinking it is brand-spanking new,” Fifi laughs. “It fits the period of the home.” She says that is the difference in hiring a professional designer and architect to remodel a space. They help you seamlessly blend together new and old. The casual hearth room completes the main floor renovations. Added on to the back of the home, the room was important to the family and is an extension of the kitchen. It’s a place the kids can be while the wife is cooking dinner, and for that reason Fifi custom designed the sofa in an indoor/outdoor fabric for durability. New French doors lead to the back yard and patio. 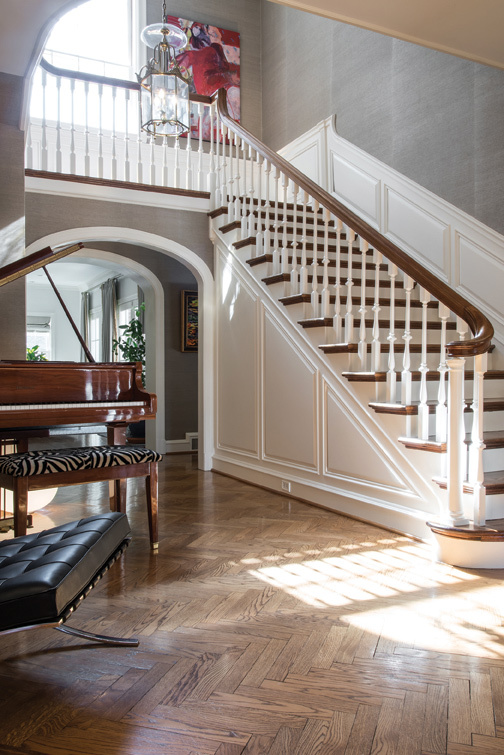 The doorway leading back to the entry was rounded and trimmed with custom molding by PK Construction to make it look as if it is original to the home. Honoring the architecture of the home while adding their personal contemporary stamp, the homeowners have transformed their residence into a place functional for their family. Fifi says what made the project so successful was the collaboration between architect, designer, contractor and homeowner. The homeowners were not only open to suggestions, but they respected the outstanding talents of each of the professionals brought on board. “When you can appreciate each individuals work as it comes together as a whole then it all works really nicely together,” Fifi says.